Today is Yoko Ono’s 82nd birthday, and to celebrate she is releasing two 10-inch vinyls. On Antony & Yoko, Ono and Hegarty’s duet, ‘I Love You Earth’, is backed with Hegarty’s solo rendition of ‘I’m Going Away Smiling’. Yoko Ono & John Zorn features an improvisation named ‘Blink’, which is the only performance by Ono and Zorn to ever be recorded and released. Both records are available to buy now, with proceeds benefitting the Rain Forest Trust and The Stone (John Zorn’s non-profit New York performance space) respectively. You can listen to ‘I Love You Earth’ online now by clicking here. Yoko Ono’s limited edition book explores her musical journey from the age of four. 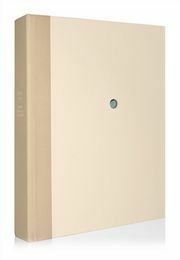 To order YOKO ONO INFINITE UNIVERSE AT DAWN today, click here. 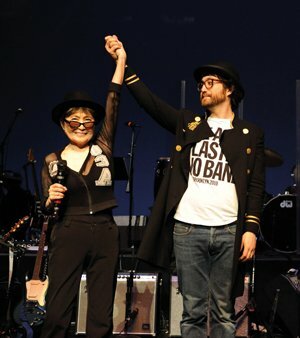 Pictured left: Yoko Ono and Sean Lennon celebrating her birthday in 2010, Brooklyn Academy of Music, taken from YOKO ONO INFINITE UNIVERSE AT DAWN.